1st Tim Thomssen Mild Obsession 11A: Mild Lincoln Lagers! 1st Tim Thomssen Raspberry Bush 28B: Fruit Cider Lincoln Lagers! Co-Brewer: Brian Hoesing Festbier 3B: Oktoberfest/Marzen Lincoln Lagers! 1st Tim Thomssen Drunkel Tim 4B: Munich Dunkel Lincoln Lagers! 2nd Tim Thomssen Rock Out With Your Decoction Out! 5C: Doppelbock Lincoln Lagers! 3rd Tim Thomssen Drunkel Schwarz 4C: Schwarzbier Lincoln Lagers! 2nd Tim Thomssen Humble Blonde 6B: Blonde Ale Lincoln Lagers! Co-Brewer: Dustin Piercy, Lance Anderson A Life Less Ordinary 8A: Standard/Ordinary Bitter F.O.A.M. Co-Brewer: Sara Farmer Crazy Red Head 9D: Irish Red Ale F.O.A.M. 2nd Kurt Smelser Crazy Red 9D: Irish Red Ale C.R.A.Z.E. 2nd Tim Thomssen Cheech & Chong 10A: American Pale Ale Lincoln Lagers! 2nd Tim Thomssen Speakeasy Porter 12B: Robust Porter Lincoln Lagers! 2nd Tim Thomssen Hop-Tarded 14C: Imperial IPA Lincoln Lagers! 1st David Thompson Funky Cold Medina 16E: Belgian Specialty Ale F.O.A.M. Co-Brewer: Sam Bates, James ErmanHammer, Paul Breitkreutz, Nathan & Emily Ruwe Turned On It’s Head – Flanders Red 17B: Flanders Red Ale Lincoln Lagers! 1st Tim Thomssen Violet Beauregard 20A: Fruit Beer Lincoln Lagers! 3rd Tim Thomssen Alcoholocaust 22C: Wood-Aged Beer Lincoln Lagers! Co-Brewer: Theresa Thomssen Koo Koo For Coconuts 23A: Specialty Beer Lincoln Lagers! 1st Tim Thomssen Raspberry Tart 20A: Fruit Beer Lincoln Lagers! 2nd Tim Thomssen You Got Peanut Butter In My Chocolate 23A: Specialty Beer Lincoln Lagers! Full results are available in this Adobe PDF document. The Land of the Muddy Waters is an AHA sanctioned hombrew competition. Each fall, entries from all over the country vie for one of the coveted Best of Show tap handles. Experienced and new homebrewers alike benefit from the feedback given by BJCP judges and professional brewers, while having the fun of competition. This year’s competition falls on Saturday, November 8th. Online entries are accepted from Sunday, October 12th through Thursday, October 30th, 2014. Please ship entries for arrival no later than Thursday, October 30th. After registration, print out the standard BJCP/AHA bottle ID form for each beer: www.bjcp.org/docs/BJCP_BottleID.pdf Please include the name of the beer on this label, and send us 2 brown or green 10-14 ounce bottles for each entry. Please zip-lock and rubber band a completed bottle label to each bottle. Do not use glue or tape to secure the form to the bottle as your entry may be disqualified. Please send your check/money order with your beer entries. If paying via PayPal, PLEASE include a copy of your receipt with your entries.You will receive a confirmation email when your shipment arrives. a reduced rate of $6 for each entry thereafter. Please make checks payable to MUGZ, or use the PayPal option. For those who have labels for your beers, you may now have them judged as well as the beers they represent. There is a catch though – only beers that are entered in the LOTMW competition may have their labels evaluated. As you fill out your online entry form, you will notice a category for ‘Label’. This is where your entry will be noted. Write the name of the beer on the back of a hard copy of your label and include it/them with your beer entries. We ask that you only submit labels that are crafted and designed by you, the brewer. Please no professional labels. If you happen to be a graphics professional that also brews, that is fine. The labels will be judged the same day as the competition and notification will be sent out as well as listed on the MUGZ website. There is no fee to enter your labels. Do you brew a beer you and your friends love that doesn’t fit a BJCP category? If it is the color of the Muddy Mississippi, then this is your category. Beers will be not be judged to any guideline, rather they will be judged more hedonistically as a session beer. The winner of this category will not be eligible for The Best of Show awards. When entering online, scroll down and enter incategory 29A ~ “Muddy Waters”. Winner of this category will receive a small prize TBD. This year’s main judging session will take place on Saturday Nov 8th at the Blue Cat Brew Pub starting at 9 am. There will be a preliminary judging session to be held in the office space adjacent to U.BREW in Moline on Friday Nov 7th at 6 pm. We welcome you to participate as a judge or steward at either session. MUGZ will announce the winners at an awards ceremony after the competition, approximately 5-6 p.m. at Blue Cat Brew pub. Winners unable to attend the awards ceremony will have their awards mailed to them in a timely manner. MUGZ will attempt to have the score sheets available at the awards ceremony; otherwise they will be mailed in a timely manner. Prizes will be awarded for first, second and third place in each qualifying category (except for the previously mentioned ‘Muddy Waters’). The winning beer from each category, (except for the ‘Muddy Waters’), will compete against each other in a Best of Show (BOS) round. The top three BOS beers will win special awards. This AHA/BJCP-sanctioned contest is organized by MUGZ (Mississippi Unquenchable Grail Zymurgists). 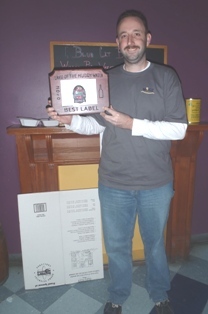 LoTMW 2014 is one of the last qualifying events for Midwest Homebrewer of the Year. 309-948-4131 or jsweat_php@yahoo.com so arrangements can be made. For those who desire more private accommodations, the Holiday Inn in downtown Rock Island is located at 226 17th St, Rock Island, IL 61201 (It is about 2 blocks from Blue Cat Brew Pub, the site of the LOTMW competition.) To reserve, contact Jamie DeRudder, Director of Sales at 309-794-1212 Ext.1205. (877) 410-6681 or (800) 718-8466. Mention you are coming to town for the MUGZ homebrew competition. For any additional information about the competition, contact Jason Sweat at jsweat_php@yahoo.com 309-948-4131 or visit our webpage www.mugzhomebrew.org. Thank you and we look forward to seeing you at the Land of the Muddy Waters! This competition is open to all homebrewers, MUGZ members and non-members. Beers brewed in commercial licensed facilities are not eligible. Judges may not judge a category they have entered. MUGZ will take the utmost care in ensuring that the competition is conducted in a fair and impartial manner. If a problem does arise, contact the competition organizer (Jason Sweat), and explain the situation. The competition organizer will then render a decision that will be final. It is the sole responsibility of the entrant to complete all registration and recipe forms, enclose the proper entry fee and designate the category and subcategory in which he/she wishes his/her entry to be judged. Under no circumstances will registrars, judges or directors categorize entries. Beer will be judged only in terms of the categories and subcategories listed in the beer style list. If entering categories 16E, 17F, 20, 21, 22B, 22C, 23, 24-28, you MUST specify information relating to ‘Special Ingredients/Classic Style’. Entries must be referred to by category NUMBER and subcategory LETTER. If a category does not have at least five entries in, it will be collapsed into a similar style. If this happens, the judges will be notified, and will judge the beer as the correct style, but it will then compete in the collapsed category. An entry must achieve a minimum rating of “good” (25 points on the BJCP score sheet) to qualify for an award. MUGZ does not have to award first, second or third place if beers are not of proper quality. Any beer not used in the competition will become the property of MUGZ. We have a fantastic hobby! There is tons to learn about, lots of great experiments to try, and many good friends to share the fruits of our labor with. All that aside, we do need to remember there is a constant need to pay attention to safety. We work with large volumes of boiling liquids. We work near open flames. We have propane cylinders full of flammable gas and CO2 cylinders full of invisible gas which could potentially asphyxiate you if release in an enclosed space. I had a reminder of this need for safety this weekend. I had finished brewing my latest batch of Maibock and was cleaning up to get to an afternoon appointments. Because I was thinking about getting going I did not have my full attention on the process, and I did not leave my brew kettle cool long enough before flipping it over to drain. A second of contact time with hot metal was all it took to remind me of the error in my ways. The point of this post was not to dissuade anyone from our great hobby, but to serve as a gentle reminder to pay attention to the task at hand and always focus on safety. Cheers! This Saturday, July 5th started out overcast and appeared to be threatening rain. This will not stop a die-hard outdoor brewer like me. I brew outside on the deck, and I have a brewstand with I wrap in a tarp to help it withstand the elements. If it looks like rain, I will get out my ladder to act like a tent pole, and stretch the tarp over my brewing area to shed the rain. This setup accomplished, I set about brewing my first ever Light American Lager Fizzy Yellow Beer. I decided to have 25% of the grist be cooked rice. I boiled water and cooked this on the stove, and then poured it directly into my mash. I was able to recirculate my mash for about a half hour, but then as I was about to sparge, my volume of wort circulating began to dwindle and then stopped. I tried my usual method to clear a stuck sparge, I forced some of my sparge water backwards through the system. This usually does the trick to free the stuck sparge, but not this time, not even after three tries. It was time for “Plan B”. I went into the basement and located the cooler and mash braid I have not used for two years, since I inherited my current brew system. I gave it a rinse and then scooped all of the mash out into it and began to fly sparge form the cooler. This worked and I was able to collect my wort for boil. I was off to the races again. It will be a few weeks from now after fermentation when I can see how it went. In the meanwhile, there are a couple of options I need to think about to help prevent this stuck sparge if I brew this recipe again. One common option is Rice Hulls. This give some larger particles in the grain bed to help set up the grain filter and should allow for better lautering. The second option is to perform a cerial mash rather than just adding the boiled rice to my main mash. This option begins the conversion of starches into sugars during the gelatinization of the rice starches. Given how gummed up my system was with the rice starch, I think the latter option is probably in order.